"I like this article! Wonderful! Always wondered if I was doing it right! 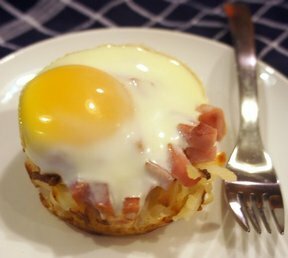 ... read full review"
A coddled egg is one that is cooked more slowly than a boiled egg, but basically, it yields similar results, except that the egg becomes quite tender, more so than with the hard-cooked method. 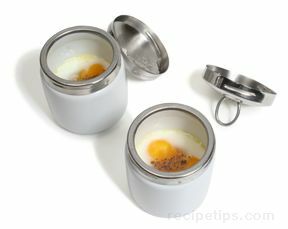 The two methods that are most often used for preparing coddled eggs: cooked in the shell and cooked in a coddling dish. The following steps can be used for coddling eggs in the shell. 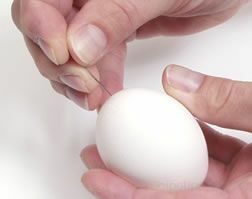 Pierce the large end of the eggs with a pin or needle. This pierces the air cell in the egg, allowing the air to escape, which prevents a flat spot from forming on the large end of the egg during the cooking process. 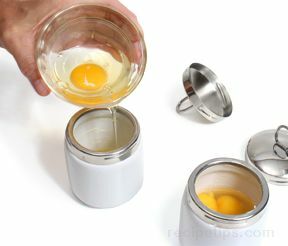 It also helps to make the eggs easier to peel after cooking. 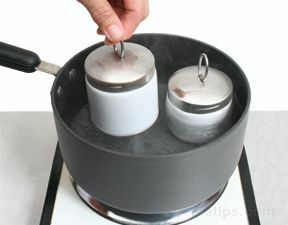 Pour cold water into a saucepan and add 1½ teaspoons of salt per quart of water. 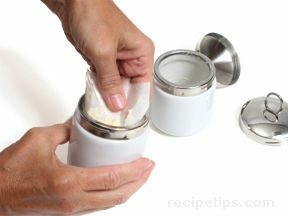 (The salt may help make the peeling process easier). 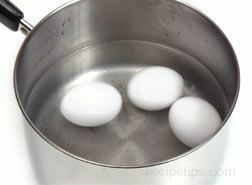 Make sure there is enough water in the pan so that the eggs will be completely covered with the water. 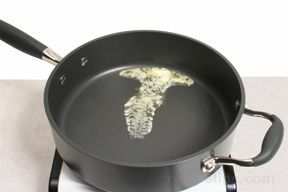 With a large spoon, place the eggs in a single layer on the bottom of the pan. 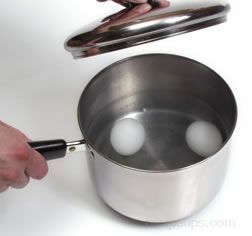 To stop the cooking process, run cold water over the eggs. It is best to use older eggs for coddling because they peel easier. Soft-cooked coddled eggs are most often served in an egg cup and eaten directly from the shell, because the eggs are difficult to peel (more difficult than hard-cooked eggs). 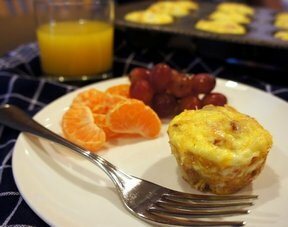 Another method that can be used for coddling eggs is to cook the eggs in special dishes called coddling dishes. The dish is most often constructed of porcelain with a metal screw on lid. Coddling dishes make the cooking process quite easy and convenient to do. 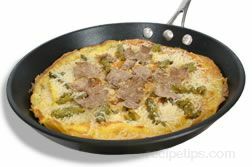 Begin by placing the coddling dishes in a pan. 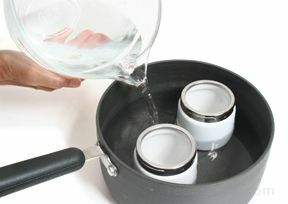 Add cold water until the water level is just below the lid of the dishes; then remove the coddling dishes, and bring the water to a gentle boil. This procedure ensures that the correct volume of water is used according to the number and size of coddling dishes that are used. Coat the inside of each coddling dish with butter or margarine. 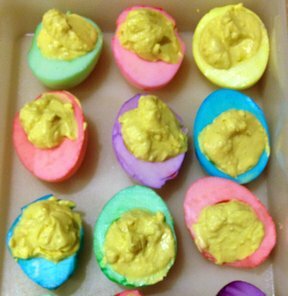 Crack one or two eggs into each buttered dish. 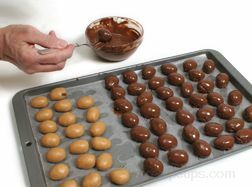 It may be easier to crack the eggs into a small bowl first; then transfer the eggs to the coddling dish. 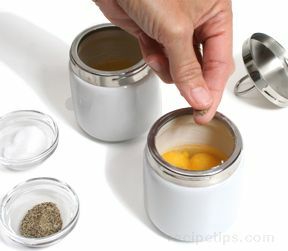 Add salt and pepper to the eggs or use any other seasonings that you would like. 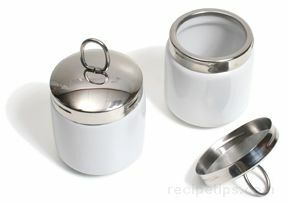 Screw on the lids and carefully place the coddling dishes inside the pan of gentling boiling water. 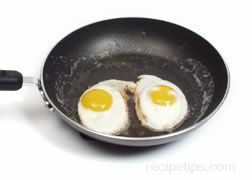 Cook the eggs for six to ten minutes, depending on the desired firmness of the yolks. 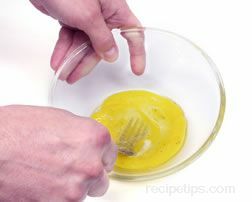 The eggs can be served in the coddling dish, but care must be taken when handling dish, because it will be quite hot. Use an oven mitt to handle the dish prior to serving and, perhaps, a kitchen towel or napkin to remove the lid, as the steam inside the dish will continue to heat the lid even after the dish is removed from the pan of water. Note: When coddling eggs, the size of the egg and its temperature at the start of the cooking process will affect the cooking time. An extra large egg will require a longer cooking time than a medium egg, and an egg taken directly from the refrigerator will require a longer cooking time than an egg of the same size that is at room temperature prior to cooking. "I like this article! Wonderful! Always wondered if I was doing it right! (I'm NOT!) But I am learning! Thanks!"